This article is a guest post by Eric Ramos of BusinessOnline. It was entered into The Hackies essay contest for the upcoming MarTech conference. Like it? You can register your vote in the contest by sharing it on social media, especially LinkedIn, Facebook, and Twitter. As marketing technology becomes more and more complex, marketers are faced with an increasing amount of data generated by the campaigns they’re running. This is compounded by the sales cycle and buyer’s journey in B2B, which includes multiple touch points and decision makers over a longer period than B2C. An engineer may read your blog post via organic search, sign up for your newsletter and get nurtured via email, while a CFO from the same company may click your display ad on a trade related web site and call a sales rep. A campaign must reach all the right contacts at the right point in the buyer’s journey through the right channels. A marketing attribution model allows you to understand what efforts are not only converting but also influencing opportunities across the entire buyer’s journey. First touch and last touch attribution models may work well for campaigns with short sales cycles, but few B2B companies have this luxury. Using simplified attribution models may cause you to pause or overfund certain programs. With a full path attribution model, you can assign values to both converting and assisting actions across channels and touchpoints. Integrating both web analytics and CRM account data will connect the dots and close the loop in longer sales cycles. There is no single attribution model that is right for everyone, but developing your own full path attribution model will allow you to more intelligently optimize efforts and budgets across channels for each stage in the buying journey. Without the insights of data analysis and channel experts, it is easy to misinterpret or misplace proper attribution from data generated by marketing automation and CRM systems. The best place to start is identifying key business questions in attribution analysis and then create a solution which will efficiently allow you to sift through the data so that you can create actionable recommendations based on the data insights. Utilizing the Google Analytics Multi-Channel Funnel API, we sourced attribution data into our connected data warehouse, Data Weld, where we store various marketing technology data. By leveraging our technology-enabled marketing service to solve for our key business questions, we found an interesting story in the Paid Search channel. We discovered Paid Search participated in nearly 2x as many conversions than it gets credit for since it largely assists organic search efforts. As a marketer who is investing in paid search efforts, you would miss out on nearly 50% of your conversions if you only looked at last touch attribution. Below you will see a few sample channel paths where organic search gets the credit, though it has been influenced through paid search efforts. For campaigns targeted to prospects in the explore phase, your goal is to make prospects aware you have resources to help them and engage with them early in their journey — not to drive immediate leads or sales. Paid search is well suited to the “explore phase” as the most reliable way to connect with prospects that are actively seeking help related to a problem that you solve. So… don’t judge the effectiveness of explore-phase paid search campaigns based solely on direct attribution to leads! If you do, you’ll end up under supporting paid search (and display, email, etc.) in the explore phase and miss out on connecting with prospects at this critical phase. Instead, apply appropriate metrics around total marketing influenced. You could get more granular with understanding of campaign-influenced conversion through additional cuts of the data to understand if the campaigns are indeed assisting other strategic channels to convert. Proper marketing attribution and analysis provide a clear understanding of which marketing efforts influence which prospects to take certain actions. They also provide insights into user behavior and consumer interaction so that marketers can develop strategies to increase conversions. The steps to ensure that marketing influence metrics are configured correctly are two-fold. First, associate all leads and contacts with an account. Second, apply qualifying logic, noting whether those individuals have been touched by a campaign. This two-step process is often best left for the experts – those with the time, talent, and experience to provide actionable data-driven analysis and proper correlations. Our team here at BusinessOnline depends on having a diverse set of experts from seasoned developers, data analysts, and marketing technologists who take unstructured data, and deliver deeper analysis and insights that can help marketers address key business questions to measure the effectiveness of B2B marketers’ programs. 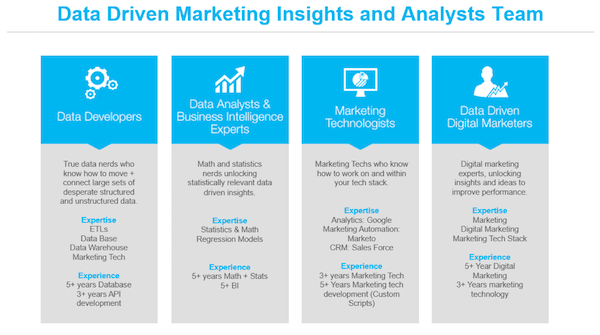 As you can see, with marketers being increasingly tasked with proving impact on revenue, it is more and more important to have analytics tools that can enable a more manual and human-touch analysis. Knowing the right metrics to measure — such as % of opportunities and revenue pipeline influenced by marketing, average number of qualified leads/contacts per opportunity and average touchpoints per opportunity — can help prove program effectiveness and the overall effectiveness of marketing within an organization. Utilizing the right tools and the right labor can truly enable the true meaning of marketing’s impact — and therefore measure program effectiveness through the entire buying journey.